Bradley Cooper On His Role In The New Comedy 'The Hangover: Part II" Bradley Cooper starred as a schoolteacher heading to Vegas for a wild bachelor party in the 2009 raunchy bromance The Hangover. He reprises his role for the sequel, alongside actors Zach Galifianakis and Ed Helms — and a drug-dealing monkey named Crystal. 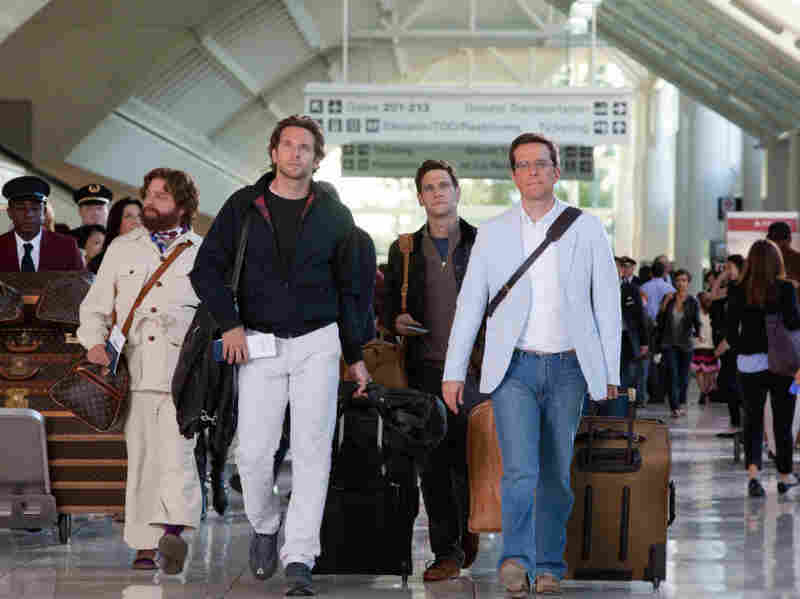 Actors Zach Galifianakis, Bradley Cooper, Justin Bartha and Ed Helms reunite in Thailand for The Hangover: Part II. Before shooting the 2009 bad-boy comedy The Hangover, costars Bradley Cooper and Zach Galifianakis decided to carpool together to the film set in Las Vegas. But there were no over-the-top Hangover-type antics on the drive there, says Cooper. "It was the opposite of what you would envision," he tells Fresh Air's Dave Davies. "There was nothing crazy. We were in a Prius [and] I think we were listening to Prairie Home Companion on the way out there." In the original Hangover, characters played by Cooper, Galifianakis and co-star Ed Helms traveled to Las Vegas for an over-the-top bachelor party for their friend Doug (Justin Bartha). The movie, the tenth-highest-grossing film of 2009, went on to win a Golden Globe and became a critical favorite. Two years later, all four actors from the raunchy bromance have reteamed with director Todd Phillips for the movie's sequel, The Hangover: Part II. In the second movie, the guys are once again getting together before a wedding — but this time, it's Ed Helms going down the aisle, and the wedding takes place in Bangkok, Thailand — where Cooper says much of the movie was reworked during the 10-week shoot. "We would do the scene, then [Todd, Ed, Zack and myself] would come back and then just start workshopping at the side of the set and then try to come up with better ideas and then say, 'Okay, okay, that works, that doesn't' and then we would go back in and do it again," Cooper explains. "So things would be created — written on the day they were filmed [and] they were reworked just at the side of the set." The result, he says, is a scripted movie with an improv-like feel, with actors who work well together because they genuinely like each other off-set. Helms, Galifianakis and Cooper — who met shortly before filming the first Hangover film — have spent holidays and vacations together and regularly hang out together in Los Angeles. "All three of us could not be more different, yet we share a real affinity for the same kind of comedy," Cooper says. "And then [one year] Ed and I flew to North Carolina and rented a car and drove to Zack's farm for New Year's and then [we were] together promoting the movie — and the next thing you know, [we were] in Bangkok for 10 weeks, shooting the second one." Zach Galifianakis, Bradley Cooper and Ed Helms face off against a drug-dealing monkey in the sequel to the 2009 bromance The Hangover. Cooper also reunited with a monkey named Crystal, who he first worked with in the 2006 film Failure to Launch. In The Hangover II, Crystal plays a drug-dealing monkey who provides belly laughs during her scenes. "I got tons of scratches from Crystal," says Cooper. "[My character] Phil and the drug-dealing monkey become quite close physically throughout the movie. ... And there was this one scene, where we were in Bangkok with an elephant as an extra in the background. ... Every time that elephant came within 15 feet, Crystal would just claw into my shoulder. And I had scars the entire time I was doing the movie." "We knew we wanted to do a sequel when we were filming the first one. Warner Brothers was so excited with what they were seeing that they pitched to Todd Phillips, 'What about, can you envision a second story for these guys?' So we sort of laughed at the idea, especially given that one of the major story ideas is an Asian guy's nether regions on my neck. At that moment, I did not think that this would merit a sequel. But in fact, it did. So I was over the moon that they even entertained that notion so early." "I was always scared [in high school] of being in front of people. It terrified me. That said, I always knew I wanted to be an actor. So in there lies a huge dilemma. ... When I got to college, you couldn't even minor in theater at Georgetown. ... I also didn't feel at all comfortable with the theater crowd when I was in high school. I never felt any connection to those students and so too was it true at Georgetown. I had nothing in common with them. Maybe I was intimidated by them. ... I was a lover of film so I didn't know anything about theater and they were much more theater-oriented." "It was my third year in grad school and I just happened to audition for that movie. All of a sudden, I found myself surrounded by people who found funny what I found funny. And I couldn't believe it. It was an incredible experience. ... It was an incredible cast. We all lived in the infirmary in an actual camp for a summer." "[My character] was a composite of three or four guys that I went to high school with. The thing about these types of guys, I was completely infatuated with them in the sense of how they go about living their life so seemingly carefree. And they're so despicable yet people gravitate towards them. And women like them, yet they're so demeaning towards women. And I find myself fascinated by them. There's a weird quandary about this type of man. So I studied them in high school. So then when I played this guy ... having observed these guys in high school, and wanting to be them in many ways, it was very easy to inhabit that role — and very therapeutic."